I got married this summer which was super fun. We had a potluck and played kickball. Feelin’ pretty sappy about it today! 10 years ago my sweetheart made me an unanticipated breakfast. There was hardly a thing in the house so we each had a microwaved potato with cumin and tomato paste. For this inspired dish pictured above I popped the whole cumin seed in oil. Then I added cubed red potatoes that I previously soaked in some salt water so they would be less gummy. Cooked them until they browned some and were tender. 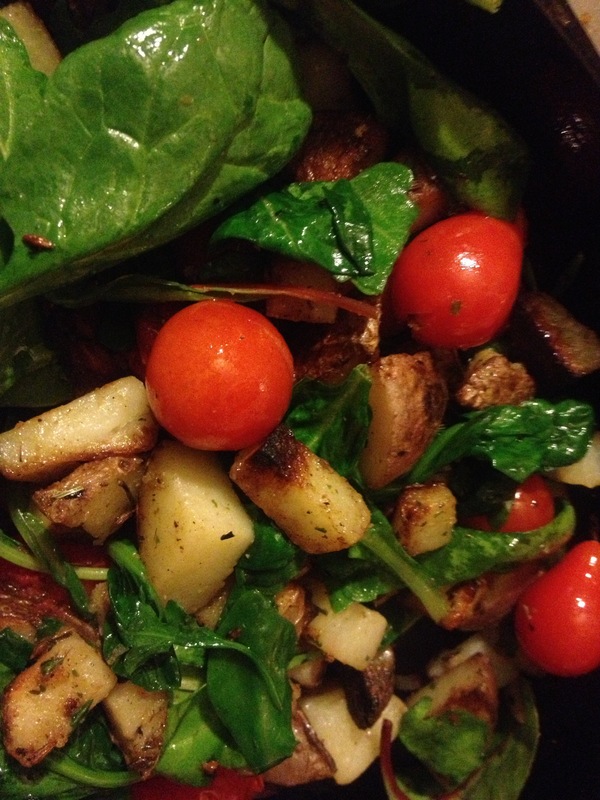 Then I added cherry tomatoes we grew in the garden and some baby chard and spinach. A little garlic powder and salt, and the ‘first meal’ is reinvented.